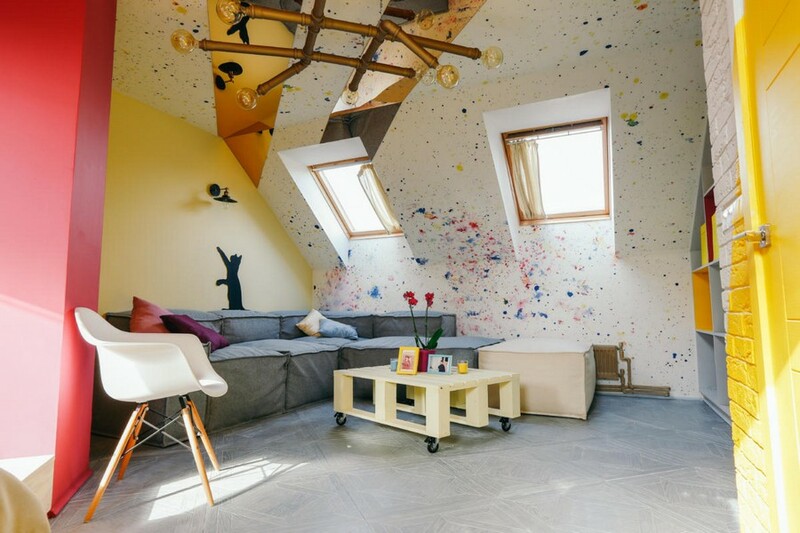 Today we’ll show you a re-made attic interior design. 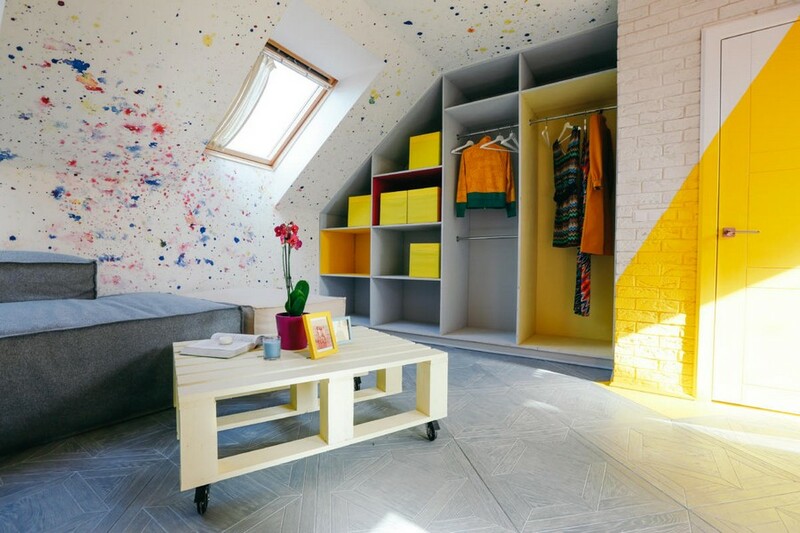 It is definitely memorable in all aspects: color scheme, layout, decoration and functionality. 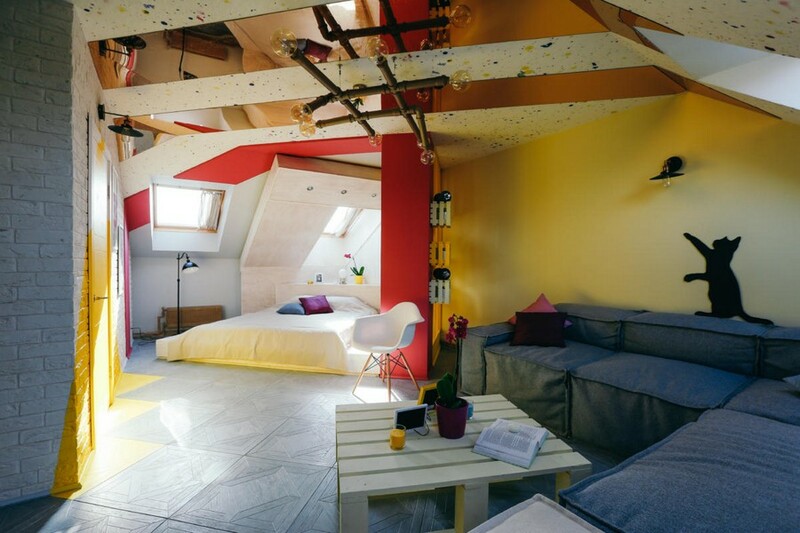 The owners’ only wish regarding their future interior was a bold bright color palette. The designer team decided to develop this idea further and coupled a bold color scheme with a peculiar and absolutely non-standard layout – diagonal. The predominant color of the interior is gray and its versatile hues. They create a perfect neutral background for bright accent. One of the walls is dressed up with bespoke wallpaper. 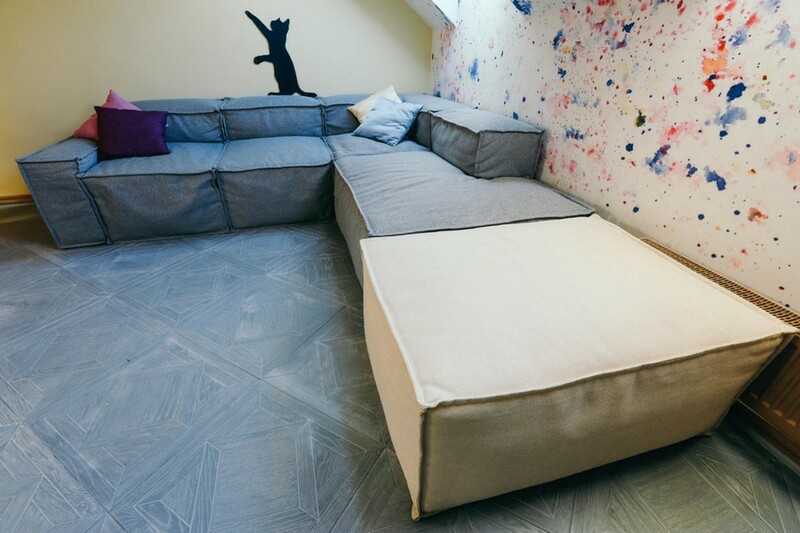 Its pattern was custom-designed and hand-painted with special silver-based paint – thus, the room may boast a permanent ionizer. The other wall is finished with white decorative faux brick ceramic tiles. 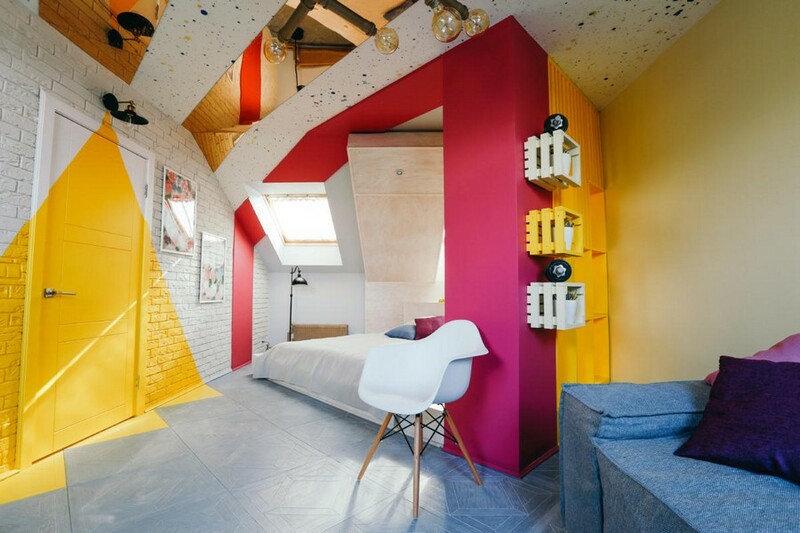 One of the accent colors of the room is fuchsia: it was chosen to decorate a load-bearing column and a ceiling line connecting it with the other part of the room. This visually separated the bedroom zone and highlighted the diagonal furniture arrangement. The bed is located on a wooden custom-made podium. 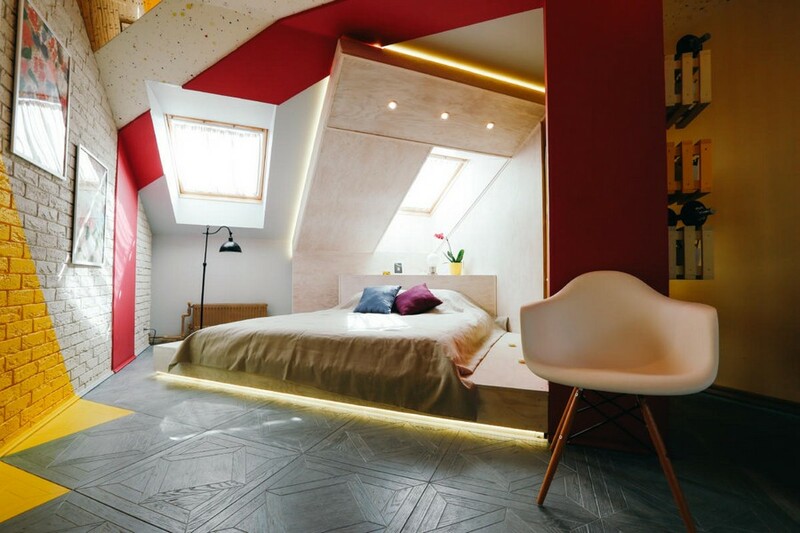 The latter is made from 18-mm thick veneer sheets, as well as a decorative lighting composition above the bed. 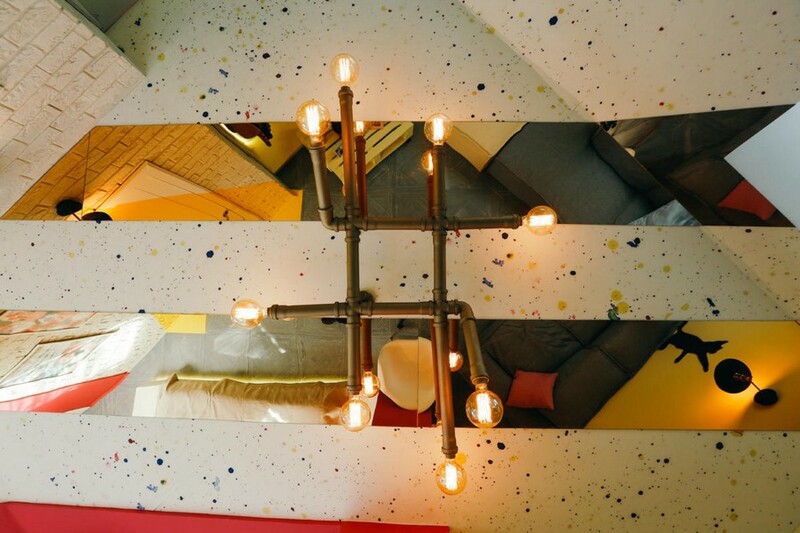 One more element highlighting the diagonal concept is plastic mirror panels on the ceiling. 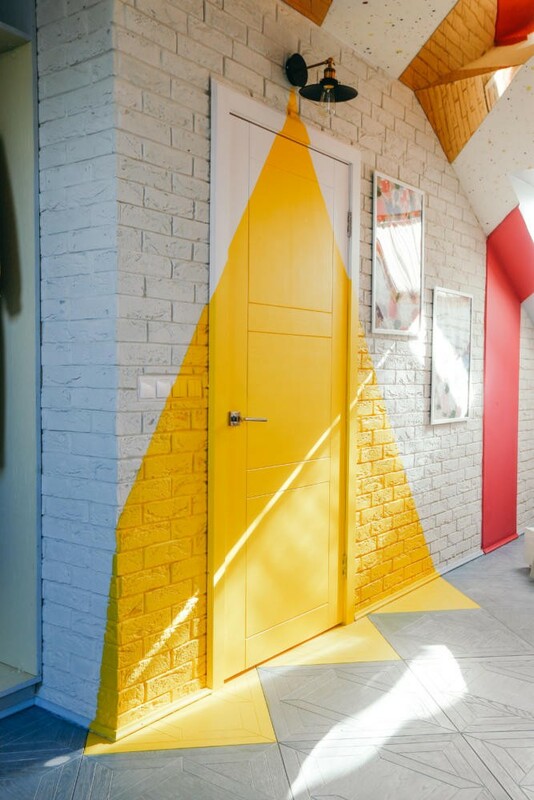 And speaking of the interior peculiarities, we can’t but mention a yellow wall décor in the door zone. 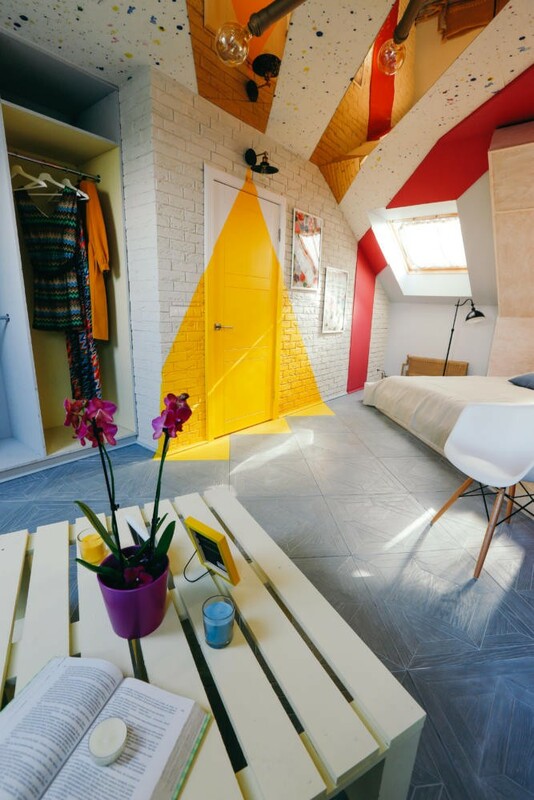 The bright cone imitates the light of a bulb hanging above the door, whether it is on or off. The flooring is made from modular brushed bluish white parquet boards. It ideally preserved beautiful natural wood grain and thanks to brushing it got a noble aged look. The corner sofa is modular, which means that the owners can re-arrange its soft blocks to their liking. The sofa framework is made of natural wood and the upholstery – from rough sackcloth. 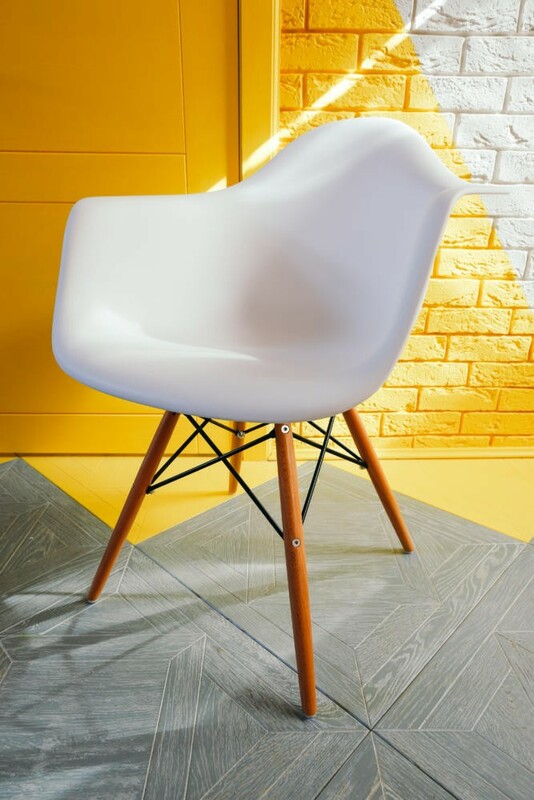 One more piece of sitting furniture is a plastic chair with wooden legs. 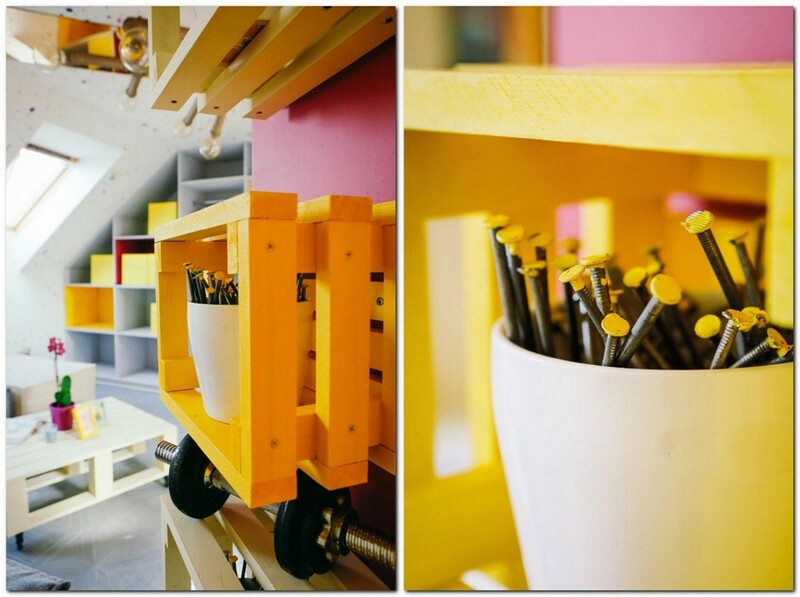 And one more bright splash of the interior is a yellow shelving unit made from common wooden boards. Though the coffee table seems to be made from wood pallets, which is one of the key trends in furniture design, it’s actually made from planed wood boards that are more durable than the pallet material. Despite its big size, it’s pretty mobile thanks to rubber wheels. And the finishing designer touch and the main source of light is a lamp made from bronze color pipes. This non-standard model combines practically incompatible retro and loft styles and ideally fits into the authentic concept of the interior.